The train arrives in Harpers Ferry. 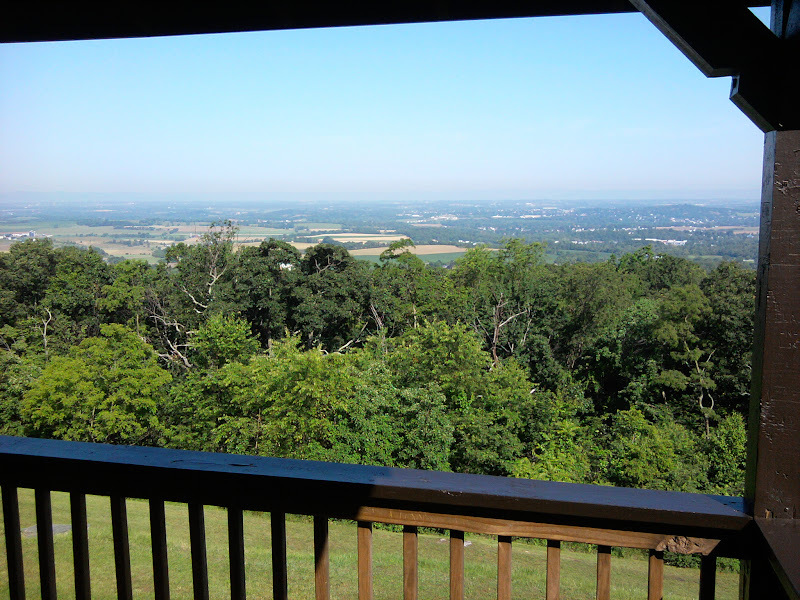 As I traveled from DC, watched out the window as terrain changes from tamed suburban Maryland, adding creepers, then steep hills, then river and wildness. Walked to Teahorse Inn hostel, 5:45PM. A few guys lounging, but I feel the outsider with clean clothes and feet not beat up. Go down the hill for a sub, back up to shower and whatever is next. Wow, I feel awkward and uneasy. Pre-hike jitters. Dakota Dan, John, and an ATC volunteer, Peter Pan AT94, who stays in the hostel are in the lounge, but others are pretty quiet. A chess game starts. Through an open window I hear songbirds so different from New Mexico but similar to Haverford campus that I just visited. So loud it will take several days to keep from getting wakened, even inside. 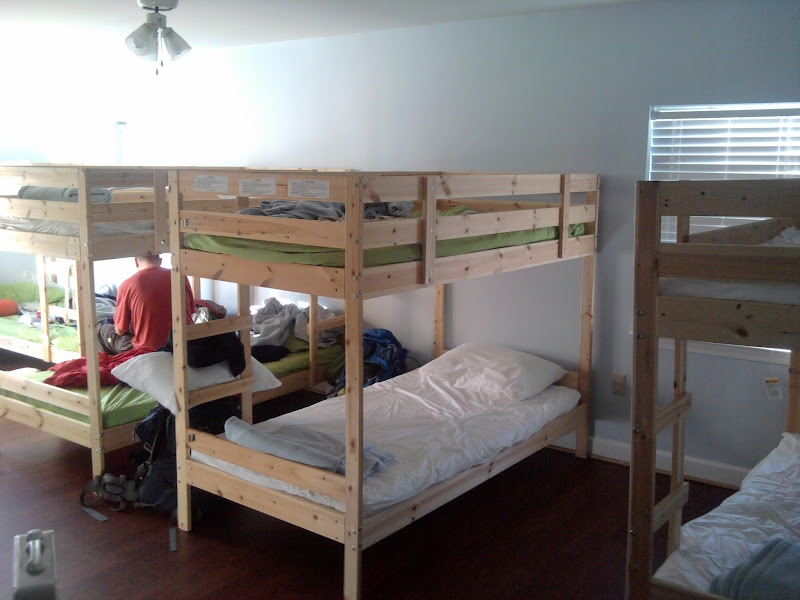 Ten double bunks for the guys, probably almost all filled up. 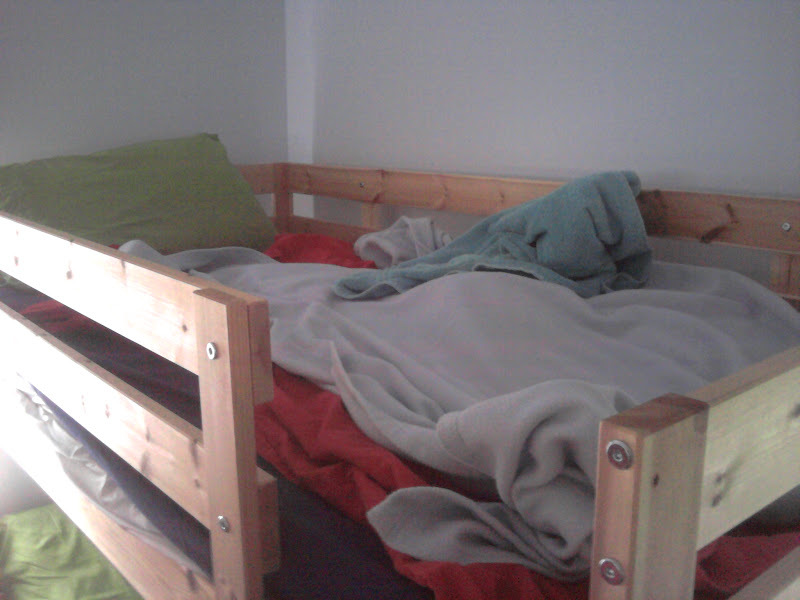 A smaller womens bunk room, with indeterminate small number. Nicely appointed hostel as a good start for the adventure. I pumped the ATC volunteer for recent news about the trail. He hiked south-to-north twice. Says 90% of trail has changed, with more switch-backs, and less steep scrambles. Also, he caught Lyme disease while working on a trail crew, and required a second round of antibiotics after a blood test, although he did not have symptoms the second round. Laurel, hostel owner, comes up to chat with us. Teahorse Inn was a place she stayed in China, and she liked the name. Former teacher here. Moonwatcher sleeping already. Mad Hat still down at Italian restaurant. Skunk Ape on phone outside. In Florida Sasquatch is known as “Skunk Ape”, hairy biped that emits an odor. Named himself. Broadsword carries a foam rubber sword. Animal carries a five pound bucket of food for strength training. Another hiker, Honey Badger, arrived at the hostel in the night, bring the total to eleven, plus one female cyclist He slept on a cot out in the lounge (since the bunk room was full). 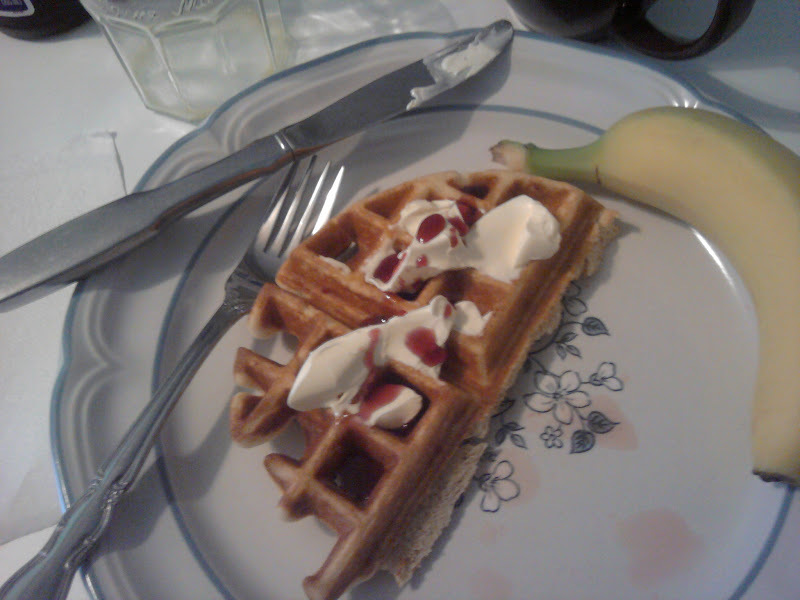 Laurel had three waffle makers (motel style) going at once, offering thick Belgian-style waffles and watermelon and bananas. With such a fine meal we were bound to accomplish great deeds today. After breakfast I said my goodbyes to Laurel. Turns out she had been running the hostel for just two years, and yes, she knew she was not on the AT Companion 2012 map yet. I will heartily recommend the spot to other hikers. Took my pack and strolled to the historic district to wait for post office and Appalachian Trail Conservancy office to open, and quelle surprise, all the history museum buildings were open early. 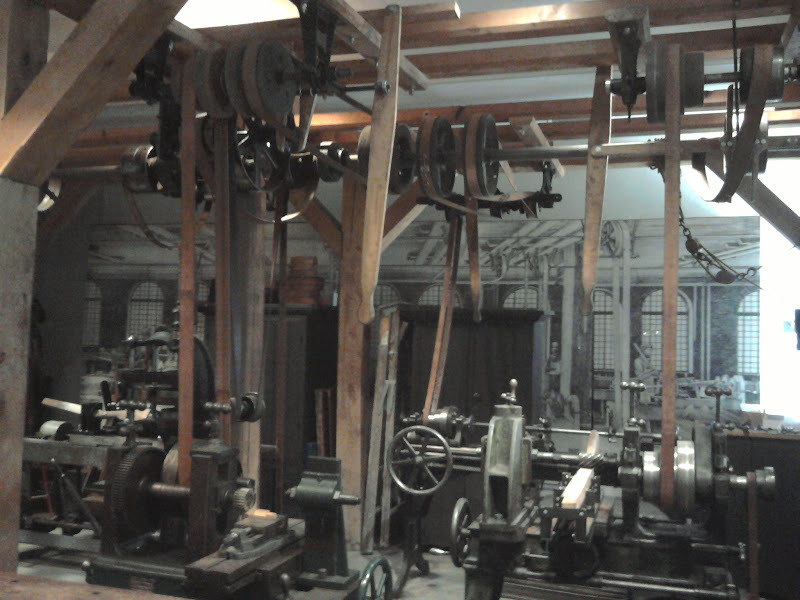 Particularly enthused over the industry building, with belt-driven machinery to make a rifle, lock, stock and barrel… though none was actually operating. 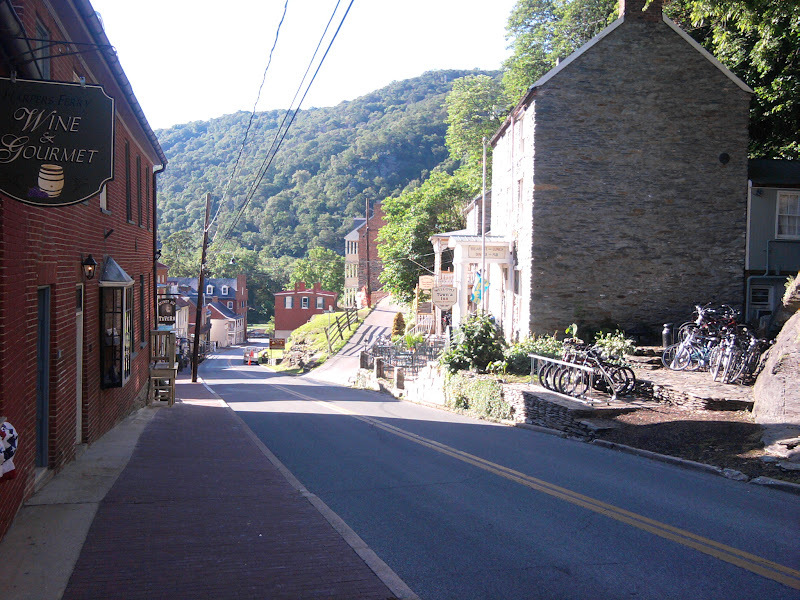 Departed, passing once more through the historic/tourist section of Harpers Ferry. Do I get an early lunch snack on my way out? Naawww, time to hike! Crossed the B&O (Baltimore and Ohio) trestle. Hiked for a couple of miles along the remains of the B&O towpath, which of course is flat without rocks. Oh, if only the rest of Maryland is this easy (foreshadowing). 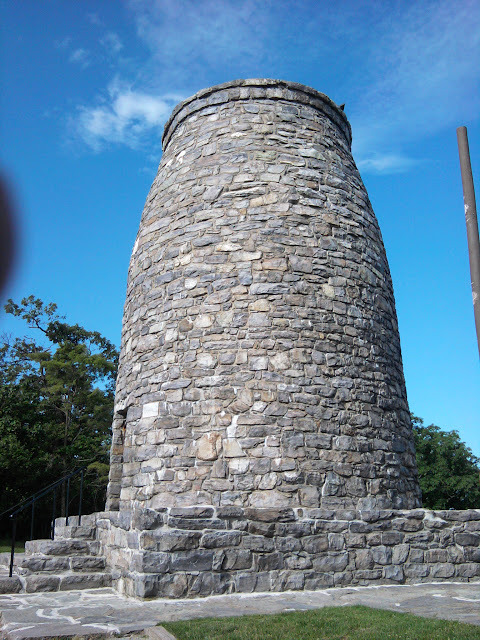 Climbed up Southern Mountain, which had Civil War significance, like most of the area. Had to stop at Ed Garvey Shelter and climb down a long path for water. Mostly ate lunch while hiking. By the time I got to Compton Gap Shelter, my scheduled stop, it was only 4PM, and I feared idle hands, so determined to try another five miles to Rocky Run Shelter. Almost immediately I found out why it had gotten that name, ans the Trail filled with softball-to-basketball-size rocks spaced together too close to avoid. My feet were getting hammered, and I even felt a twinge in the knee. Adjusted my stride somehow, and the knee stopped bothering me. Finally the last mile was down a steep incline, still filled with bruising rocks. Easily passed by last hiker from night before. 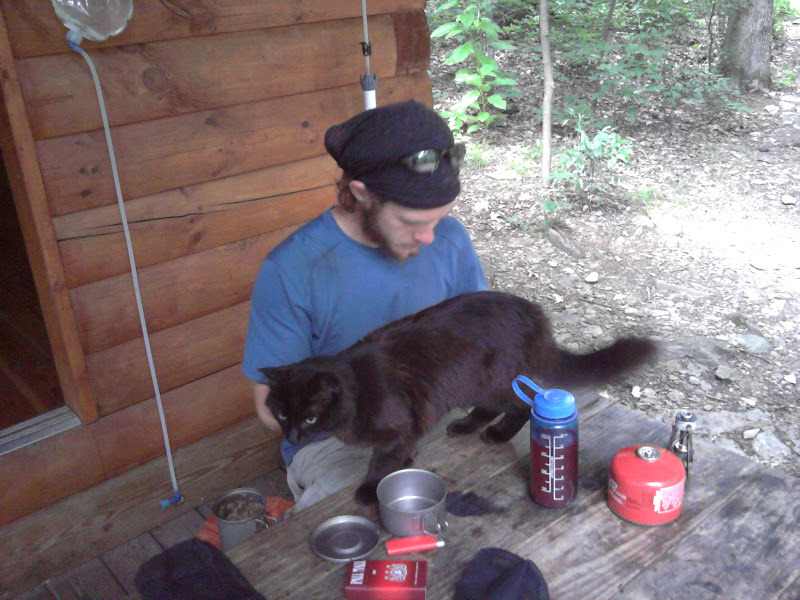 Wearily pulled into Rocky Run Shelter, joined by Honey Badger and another long distance hiker named John, 50-ish, no trail name, plus a cat! The black cat sneaked off with Honey Badger’s cheddar cheese, and he had to chase it down and get back the rather sizable quantity. Cat was a pest with begging, and threatened to steal all our dinners. Dinner number one on the Trail was curry, beans, and rice, and was the best meal I have fixed in ages. 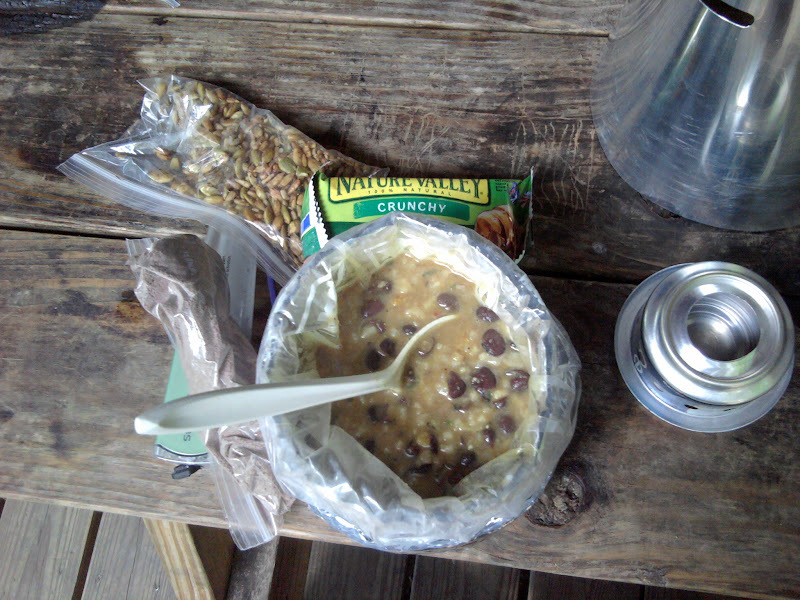 There is something about a hot meal while backpacking that justifies the extra gear and time. Both shelter mates turn in early and are asleep by 8:30. I try a cold sponge bath which feels amazingly good to boost my spirits, so may do that regularly when weather is not bad. Now at 9PM, really too dark to write, so I will try sleeping on my tiny tiny mattress pad. Woke up early, started stirring around 6AM, decided to no-cook and eat breakfast on the Trail. No bad effects from yesterday’s long-ish day, though I know for the the second day is where muscle pain hits. The dried Logan bread was just barely able to be bitten into chunks without dunking– but just barely. Would be pretty embarrassing if I had to get off the Trail with a broken tooth. Though tough, the Logans were tasty and filling, and kept me going throughout the morning. At the next highway crossing I tried to send a text to “Base Support”. I could see the battery drain as the poor cell phone transceiver struggled to send text to a distant cell tower. The phone did not think the text was sent, but a later reply confirmed it made it. Near the Washington Monument (not the famous one, the older one in Maryland) I stopped at a picnic pavilion to top off the cell phone battery for a few minutes while taking advantage of a nice restroom. My rest stops this trip will tend to be near AC power. John (Just John) caught up and passed me, but was going to stop a bit at Pine Knob Shelter. I had enough water still, so keep going. At Pogo Memorial Campsite I met an Appalachian Trail Land Ranger picking up trash, who observed the campsite was a mess and needed a resign. John must have passed by while I was getting water at a spring at Pogo. Ate lunch while hiking with no stopping to put in some miles. Some part of the Trail easy going, but other sections were hella-rocky. By afternoon thighs and shins were complaining, forcing a 3 mile/hour pace down to 2 miles/hour. Around 2PM near Ensign Cowal Shelter. It threatened rain. Stopping at two would be rather early, so I pulled into the shelter to make cocoa and snacks and have a real rest. Eventually the rains abated, so I proceed on. Around 5PM passed by Honey Badger. By 5:45PM rain started, big heavy drops with thunder, too much to ignore. Got a chance to try out my umbrella, which I had been carrying in a front pocket for the last couple of hours because of threatening clouds. The bumbershoot worked a treat– keeping my dry while easy to carry, and no sweating or claustrophobic feeling from drops on a hood. At shelter was a strange pulley system for hanging food bags, first I have seen of that type. Late, and dark, 9PM before dinner, hanging food bag, cleanup, and journal. Time to figure out sleep system again. Waited to stir until 6AM because of the crowd. Out by 6:30, no cook, and shortly encountered a huge steep downhill boulder field. 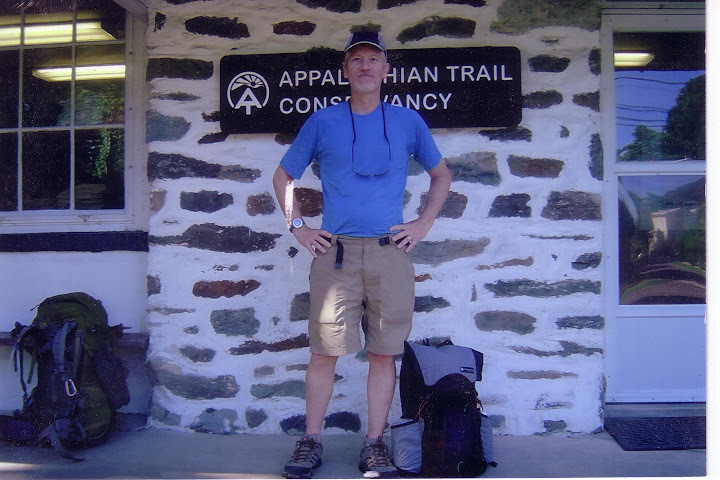 As Just John zoomed past, he commented that anyone doing the Four State Challenge (hiking VA, West VA, MD, and PA in one day) would encounter that rock field late in the day, exhausted, with the sun going down. Further down, more downhill, my right shin and left big toe start hurting. Worried about the shin. Usually muscles loosen up after an hour and do not bother you until the next time your rest and start up again. This seemed to mostly hurt going downhill, and the AT has plenty of uphill. I had already planned to do a short day. Pen Mar County Park was closed, including restrooms. (But another hiker thought they were open about the same time or shortly after.) Nice view, relaxing park, just opens late. 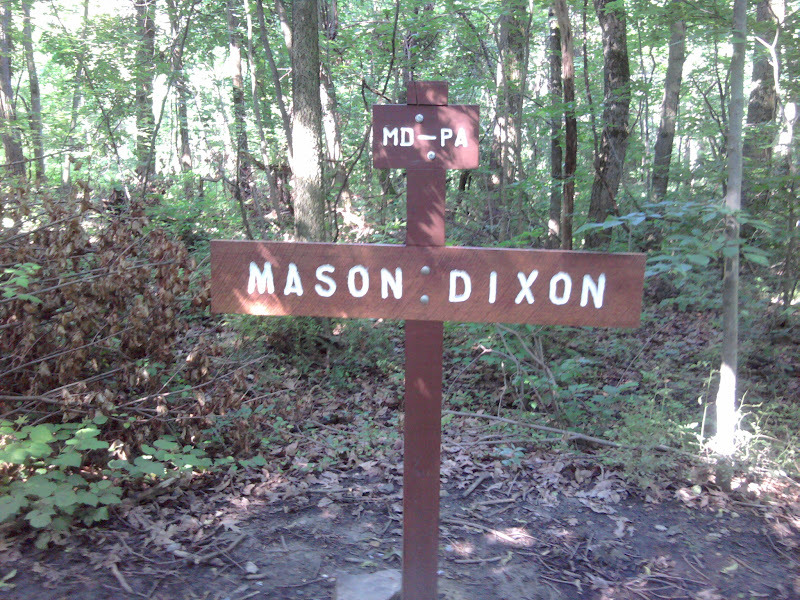 Mason Dixon Line. Foolish me, thinking it was between Virginia and Maryland. Found the road to hike 1.2 miles for Box 1, mostly through protected wetlands along a fast highway with guard-rails the whole way. Found the post office easily, and the clerk said I was the only one with a package waiting. She also handed me a box of snacks, toiletries, and assorted knick-knacks the local Girl Scout Troop put together to assist hikers. I was genuinely touched. Mailed trip journal letter and postcards. Hot dog, first 3G reception, so I found a chair in front of a nearby business and caught up on e-mail. Spied a convenience store and got a snack, and a couple of hikers who just finished their section offered me a ride back to the trail-head. Sweet! This sort of thing happens all the time along the Trail. Saw Papa Rose at trail-head. 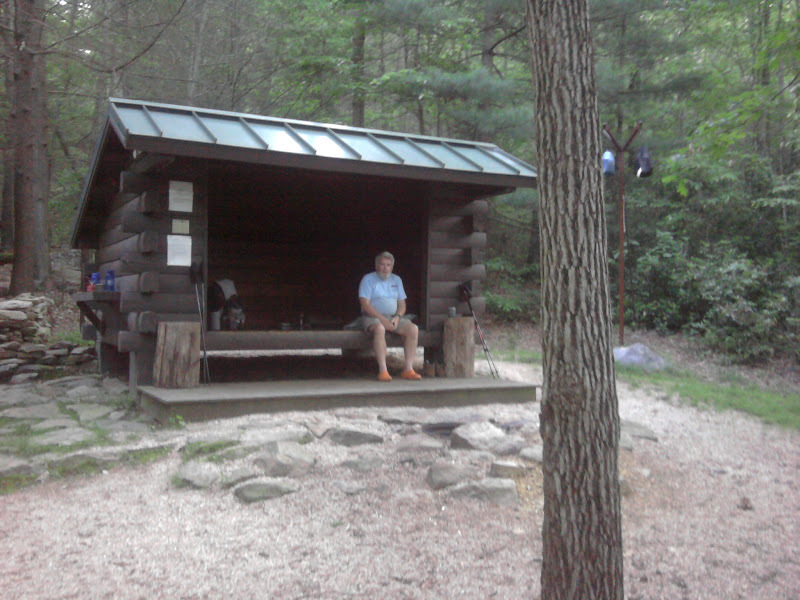 Stopped at Deer Lick Shelters for a little leg rest. When I am ready to start, Honey Badger comes around from inside the shelter and greets me as he zooms up the Trail. A late starter, but he might to 3.5 to 4 miles/hour. Finished at 4PM at Tumbling Run Shelter, the first day as per schedule at 13.2 miles. Papa John was already there, and a couple of thru-hikers who moved on. Also a Ridge-Runner was there, Calculator AT2011, whose job is to patrol a section of Trail and teach “leave no trace”. Nice guy, volunteers at the ATC office on Thursdays. Sweet, 3G at shelter. No civilization sights or sounds. I look up “shin splints” on Wikipedia. Hypochondriac much? Did not like learning that stress fractures have similar symptoms– that would be a trail ender. Of course, treatment for all kinds of athletic injuries involve huge amounts of rest– not terribly practical for a long distance hiker. Massaged my legs a long time with lotion and olive oil, which seemed to help. Hard to understand how massage will relieve a stress fracture, so hoping for a less serious type of injury. Will do a short day tomorrow, massage beforehand, and see how that goes. Lady Forward and Joss come back to the table and crack everyone up.